I think that I am going through withdrawal again. I haven't held a paintbrush in over two weeks because of a nasty cold, poor weather and then Christmas. I did have a great Christmas with family and friends and am healthy again so I am itching to get out painting. This is a painting of our youngest grandson Max and the gift that I was working on. I painted this as a demo during the Art Gallery of Burlington Christmas show and sale. I was working in the hallway and at least a couple of hundred people watched and/or chatted with me at various times. I wasn't at all happy with it but I lightened and blued the dark green background, warmed up his sweater a bit and softened some edges. I am very happy with it now and am thinking that it is time that I did more portraits in oils. We are thinking of heading up to Paudash Lake for New Years and I can't wait to get out painting up there again. Creativity for me is so unpredictable. Today was 4 C and cloudy and on top of that I was painting an urban scene which is not one of my favourite things to do. All that should have conspired against me but I ended up having a good day. This is not one of my best paintings however it is probably the first urban scene that I have ever been close to happy with. Picone's grocery store in Dundas is getting ready to celebrate its hundredth anniversary and it has been in the same family the whole time. I have often thought of painting it and I will likely do it again at some point. This took me three hours and at the end my fingers were so cold and stiff that I could hardly control the brush. It is usually tough to decide when a painting is finished but winter makes it easier. Tuesday was a great day. It was about -2 C and cloudy. It was the last Catherine Gibbon class this semester and since Debbie and I live about a hundred metres from the park I invited everyone back for an after class social. It was delightful doing the critique with wine in hand. This is my painting. It is another of the many black willows down in Warren Park. The light was very flat and I wanted to capture the visually warm feeling on a cold day. I am not sure how I feel about this painting. It is one that I will have to look at for a while to decide. Now for the reason that I am delighted. I had four paintings hanging in the Ontario Plein Air Society annual show in the Project Gallery in the art district on Queen Street East in Toronto. Twenty-eight very accomplished artists were showing well over a hundred pieces and I was proud to be included. Eight or so paintings sold and when I went to pick up my paintings yesterday I was delighted to discover a red dot beside one of mine. This is "Coming This Way" the painting that sold. We were camping in Wilberforce and the forecast was for severe thunderstorms and gale force winds. This was painted in a hurry with an eye to the sky. It was about 2 C and very windy today but eight of us braved the elements to paint at Princess Point again. It was one of those days where the light was constantly changing and the wind was rattling my board around but it was great to be out there with brush in hand, It always is. I noticed this bird box framed by the willow and sticking up out of the weeds and grasses last week but it was too exposed and windy to paint them. It was even colder and windier this week but I was determined to paint them. I am not sure if I am happy with this or not. I will have to look at it for a while. Next week we are supposed to be in downtown Dundas. I really struggle with buildings and I am rarely successful but I love a challenge. Especially in locations with lots of pedestrian traffic. Not! Yesterday we had a wonderful model for the sketch group. I produced a reasonably good portrait with my burnt sienna and white pastel pencils but I decided to add some colour. I got out my pastels and everything went south in a hurry. I am using the excuse that I only have landscape colours but the fact remains it became the worst portrait that I have painted in quite some time. Needless to say I am not posting it. shining and there was still enough colour to add some contrast to the warm greys in the rock face. My board was fully sunlit while I was working on this and the glare from my paint was so severe that I had to move to the side to see the colour. Even then I was looking at it in full sunlight so I had no idea what the colours would look like when I brought it inside. I think that I got lucky. I am quite pleased with this. I see a shade umbrella in my future. I am going to start by reminding everyone to get out to see Catherine Gibbon's show at Gallery on the Bay. Here is a sample of her work in the show but it really needs to be seen full size and in real life to appreciate all the subtle colour variations. Show details can be found in my previous post. Schedules can be a problem. Especially when your are trying to paint fall colours. The Monday Painters schedule is set in December and sometimes, like today, we end up at a location at less than optimal time. The colour in the Dundas Valley is incredible right now however when we went down Valley Inn Rd in Burlington everything was green. The day had a definite fall feel to it but the colours just weren't there. I tried to get the feeling of the season without powerful colour and I think that I managed it. I managed to finish just before the rain started. Tomorrow, weather permitting, we are back down to Cameron's Pond. I can't wait. 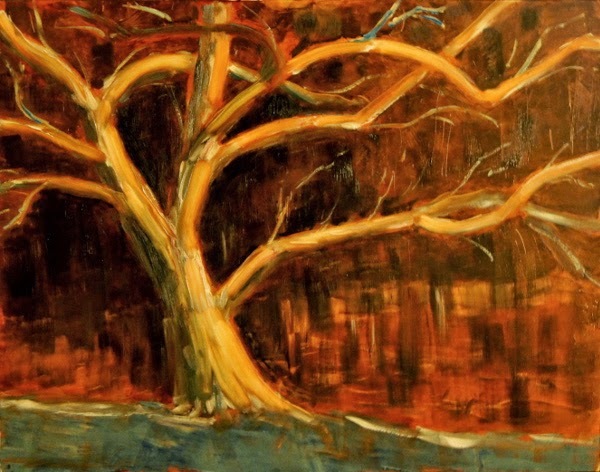 First off I have to say that Catherine Gibbon who is my plein air instructor/mentor has an amazing show on right now at Gallery on the Bay in Hamilton until November 16th. The works are all nocturnes and are all absolutely brilliant. She is in my mind Canada's premier pastelist. I cannot image anyone, no mater their taste in art, not being blown away by this exibition. I have always wanted to own one of Catherine's paintings but figured there was no way that I could talk Debbie into spending that much money on artwork. Debbie came to me at Catherine's opening reception said "I want that painting." and pointed to my favourite. YAHOO! I haven't had time to paint since Tuesday. The colour is incredible this year and it is at it's peak here so I needed to get out and get to work. 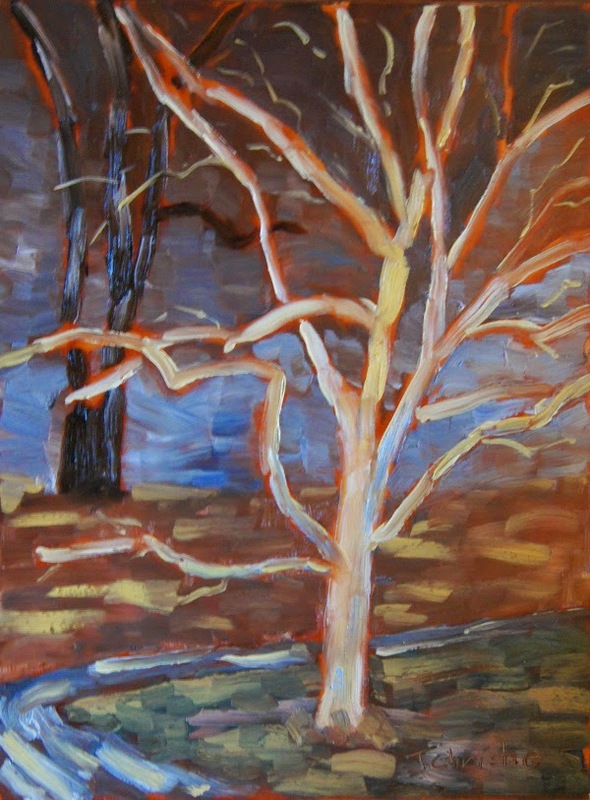 I didn't have much time so I went out the front door and painted this tree which is in our side yard. Yes it is that bright. I plan on getting out painting every day this week so hopefully the colour will stick around for a while. I found another reason to love my oils. It drizzled off and on while we were painting in Catherine Gibbon's class yesterday and those using pastels, acrylics or watercolours had to scramble to cover their work every time that it started to rain. I just kept merrily painting away. We were on a forested property hidden away at the end of a very narrow gravel road. There was a pond with a small cabin tucked away in a grove of mostly beech trees with a few maples here and there. I could probably come down here and paint every day for a month and still have lots left to inspire me. This is Cameron's Pond - 12" X 16" oil on gessoed hardboard. I am excited about this one because I think that I actually captured the scene in front of me and the feel of the day. I can't wait to get back here next week. My plan was to spend the three days on the campsite learning how to paint with acrylics. It was rainy wet and cool so all I managed was three paintings. That wasn't enough to get very good with them but it was enough to learn that I will enjoy taking them on future canoe trips. All paintings are 8" X 10" acrylic on gessoed watercolour paper and all were painted while sitting on our campsite. This is my first ever acrylic painting. It isn't a great one and I struggled to understand just how to use the medium but for a first attempt I was exhilarated. I forgot to pack a rigger so my smallest brush was a #4 flat which made painting branches a chore. I tried sticks and pine needles but nothing seemed to work. With oils I would have just scratched them out. This is the second painting and the worst of the three. I got too cocky and totally blew it but a lot was learned. Mostly I learned not to forget a rigger. This is my third painting and I am excited about it. It was fun to paint and it turned out pretty well. I had the background shore too warm and bright so the painting had no depth. I loved that with acrylics, as with watercolour, I could put a thin wash over the area to push it back. The second best part of it all was that I could throw the finished paintings in a bag and not worry about them getting ruined on the trip out. The absolute best part was that Debbie and I have started paddling in October again. It was a very grey day today and most of my friends were complaining about the lack of light however I love these moody days. It was about 18 C with no rain so it was a very comfortable day to be out. The lack of light meant that the colour variations were very subtle and very challenging to get right. Desjardins Canal was dredged through Coote's Paradise and then dug the rest of the way to Dundas so that boats could get from Lake Ontario all the way inland to the town. This meant that Dundas was a thriving mill town until the boats started getting too big to come in the canal and the Harbour in Hamilton was built. This is my attempt to capture the dull mood of the day. My perspective is a bit off on the left but all in all I am very happy with this. I arrived an hour late so I painted quickly which seems to work better for me.